This is a deeded cemetery listed in Vol 41, p 259 and 260. Half of the cemetery was deeded by Mr. and Mrs. W. M. Coffey and half was deeded by Mr. and Mrs. W. S. Osborn. It is on the Hiram Brinlee survey. The cemetery covers about 1 acre, and is fenced, and well maintained. A small sign on the chain-link fence says "Brinlee Cemetery." The gate in the fence is not locked. There are a few stones hidden in the undergrowth. A few of the stones are down. Historical marker application, approved, but not purchased. The Brinlee Cemetery in Collin County is hidden in an agricultural area about four miles east of Melissa on the Hiram Brinlee survey. Sitting near the end of CR 473 and covering almost 1/4 acre of land, the cemetery is surrounded by farm land and trees near the Brinlee Branch of Sister Grove Creek. It contains about seventy graves and is an active cemetery. The earliest marked grave is that of a child, J. C. Osburn, buried in 1874. A child of Hiram Brinlee, Collin A. Brindlee, is listed in the 1850 U. S. Census Mortality Schedule as dying in October of 1849, so the cemetery was probably in use that far back. It is said that the Brinlee slaves were buried here. A break-down of the years of burials shows that most of the burials were in the 1880s and 1890s. Fourteen of the seventy listed burials were for little children. A look at the obituaries of the people buried here shows that most of them died from accidents — accidental shootings, falling off a horse, burns— evidence of how hard life was for the early pioneers. 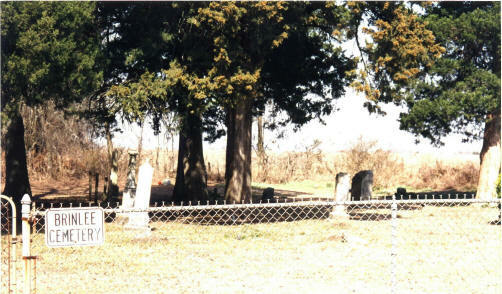 The Brinlee Cemetery is one of two cemeteries that served the early Chambliss community, which was located ½ mile southeast. The community was probably named for Dr. Charles Chambliss, who settled in the area in the 1880s. A post office was opened at Chambliss in 1898 and closed in 1903. Chambliss had a cotton gin, general store, gristmill, molasses mill and a school. A general store was located near the Stony Point Church. The only remnants of Chambliss today are the Brinlee Cemetery, and the Stony Point church and cemetery. Two deeds for a cemetery were signed by trustees of the Brinlee Cemetery in 1889. James M. Nichols, W. N. Osborn, and J. Milt Carroll were the trustees. Nichols and Carroll are buried in the cemetery. One deed is with W. S. Osborn and Harriet E. Osborn for an area 50 yards by 20 yards and the other is with W. N. Coffey and Sophronia Coffey for an area 25 yards by 50 yards. One is dated in February and the other in April of 1889. Combined the deeds total about ½ acre of land. 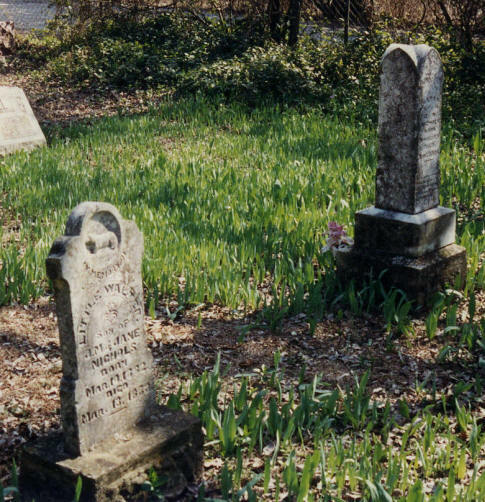 Three of the earliest residents of Collin County are buried in the Brinlee Cemetery — Hiram Brinlee, Josiah Nichols, and his wife Elizabeth Jane Fitzhugh Nichols. The Brinlees buried in this cemetery include Hiram Brinlee, David Francis Brinlee, Hiram C. Brinlee, Charles D. Brinlee, Nancy Elizabeth Brinlee and William Brinlee. Also buried here are daughter Sarah B. Anderson and son-in-law Robert B. Sims and probably son Collin A. Brinlee. S. Hiram Carrol Brinlee was born December 25, 1807, in Tennessee or Kentucky. In 1824 he traveled with the Collin McKinney clan and settled on land around Texarkana, Arkansas, as part of the Wavill’s Red River Colony. After a border dispute between the United States and Mexico, the area was declared part of the Republic of Texas. On September 14, 1832, he married Elizabeth Ann McKinney, daughter of Daniel McKinney and niece of Collin McKinney. They lived at Red River Landing in Red River County. On February 2, 1838, he was given 4,428 acres of land by the Republic of Texas for living in the territory before the Republic was founded. The acreage in Collin County was 1622.35 acres. The certificate was not filed until April 10, 1911. The Hiram Brinlee survey is Collin County abstract #30. Most of his children were born there. In 1844, possibly because of a flood on the Red River, the family moved from Red River County to the Collin County area with Collin McKinney’s family and settled at a point about four miles east of present-day Melissa. The Brinlee homestead was just west of the cemetery. Hiram Brinlee ran a general store in the Stony Point/Chambliss area. It is said that parts of the foundation of the store are still visible near the Stony Point Cemetery. All of his sons and sons-in-law fought in the Civil War. He died in 1885. His children took part in the Oklahoma land rush and most of the family moved there. Elizabeth McKinney Brinlee has a memorial stone at the Brinlee Cemetery, but is buried in Oklahoma. The Brinlees lived under four flags in Texas - the Mexican, Republic of Texas, the Confederacy, and the United States. Also buried in the Brinlee Cemetery are Josiah Nichols and his wife, Elizabeth Jane Fitzhugh Nichols. Josiah Nichols was born February 6, 1822, in Lincoln County, Missouri. He came to Collin County in 1846. He immediately joined Capt. Stapp’s Ranger company at Buckner and served until 1847. He then joined Capt Fitzhugh’s Co. and served twelve months. On February 23, 1847, he married Capt. Fitzhugh’s sister, Elizabeth Fitzhugh. He received a pension from the state of Texas for his time with the Rangers. During the Civil War Nichols was a captain with state troops in 1863. In 1864 he served in the Indian Department with the regular army. He was discharged in 1865 and appointed Collin County sheriff, serving seven months. The Nichols lived on the James Fisher survey just south of the Brinlee survey and the Brinlee cemetery. Josiah Nichols died March 28, 1915. Elizabeth Fitzhugh Nichols was the daughter of John and Sarah Fitzhugh and a sister of William F. Fitzhugh. The Fitzhughs came to Texas from Kentucky by way of Missouri and Arkansas and settled south of present-day Melissa in 1845. Elizabeth, “Aunt Betty,” married Josiah Nichols on February 23, 1847. She was the mother of seven children. Elizabeth Nichols died June 6, 1911. There are veterans of several wars buried in the Brinlee cemetery. Josiah Nichols was a veteran of two wars, the Mexican and Civil. Also serving in the Civil War were David Brinlee, Hiram C. Brinlee, A. A. Davis, and Robert Sims. Roy Cravens was a veteran of World War I and Clifford Wright was a veteran of World War II. The Brinlee Cemetery continues to serve and represent the people of this rural section of Collin County.